Stalker transcends the traditional trappings of the science fiction genre to create an elegiac vision of the remnants of the past, a tangible present and an imagined future. Ingmar Bergman deemed him to be ‘the greatest of us all’, and to enter Andrei Tarkovsky’s world is to have your appreciation of cinema as an art form forever enriched. Perhaps the clearest crystallisation of Tarkovsky’s power and lasting influence as a filmmaker came in the shape of Stalker, his second foray into science fiction after the adaptation of Stanislaw Lem’s novel Solaris in 1972. Produced by Mosfilm Studios and loosely adapted by Tarkovsky and the Strugatsky brothers, Arkadi and Boris, from their own equally critically acclaimed novel Roadside Picnic, Stalker is a visually extraordinary exploration of man’s search for fulfilment, knowledge and emotional nourishment. 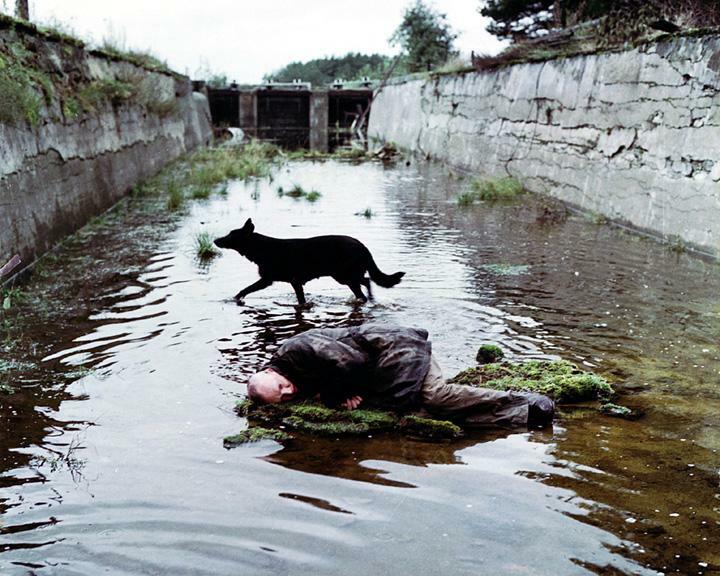 Largely shot around two abandoned hydro-electric plants and an old Flora chemical factory in the post-industrial wastelands of Tallinn, Estonia, during the Brezhnev era, Stalker depicts a ravaged future in which the citizens are desperate for a release from the constraints of an oppressive, beaten down society. It draws from the social nightmare of the former Soviet Union at the time and, retrospectively, is a prescient precursor to the visual and mental horrors of the Chernobyl disaster. The film’s narrative (part allegorical, existential road movie and part socio-philosophical tract) transcends the traditional trappings of the science fiction genre to create an elegiac vision of the remnants of the past, a tangible present and an imagined future. The titular Stalker (Alexander Kaidanovsky) is a professional, but highly illegal, guide to ‘the Zone’, a forbidden region surrounding a decaying, unnamed city, where time, space and reality constantly shift, where the slightest deviation from the path can be fatal and where at its heart a mysterious room is supposedly able to make one’s deepest desires come true. Thought to be the by-product of a visiting alien civilisation, the Zone is consequently rendered off limits by the fearful government, and the knowledge of its apparent powers suppressed from the masses. The Stalker’s latest clients - the Writer (Anatoli Solonitsyn), a fractious, despondent dreamer, and the more logical, sceptical Professor (Nikolai Grinko) - have different but equally obsessive reasons for risking their lives in the pursuit of enlightenment and an imagined subsequent peace of mind. The physical journey through the Zone mirrors the inner psychological trip made by the Writer and the Professor as they wrestle with personal torments, existential angst, each other’s worldviews and, eventually, the hidden motivations that threaten not just themselves, but society as a whole. In Tarkovsky’s hands, the linear, simple plot of Stalker is the framework around which the formation of indelible, haunting imagery and soundscapes, the excoriation of the human condition and provocative cultural, social and political dialogue are wrapped. The dreamlike atmosphere and otherworldly quality that pervade the film are realised through the complete integration of camerawork, sound, colour, image and dialogue. The bleak, repressive world outside of the Zone is filmed in a sepia tint that, even in depicting a future time, makes the images reminiscent of engravings, Victorian-era photographs or woodcuts, thus conjuring up the idea of a society rooted to the past. In contrast, the Zone is shot in colour, introduced in a seamless but striking shot, symbolising the three travellers’ emergence into an unfamiliar, potentially liberating and diametrically opposed space to that from which they have ventured. Tarkovsky muddies the waters between the two distinct environments, in keeping with the overall ambiguity of the narrative, by alternating the sepia tint and colour sequences during a dream sequence inside the Zone and latterly as the Stalker is reunited with his wife and daughter during the film’s fourth wall-shattering climax. Tarkovsky’s long, at times glacial, takes and subtle camera movements are an essential element to Stalker, as is Eduard Artemyev’s score. Artemyev, responsible for scoring Solaris and Mirror, responded to the director’s appeal for sounds that represented ‘space frozen in a dynamic equilibrium’ with a trance-like, synthesised, partly distorted score encompassing both Western and Oriental rhythms and instrumentation, and natural sounds taken from the film itself. By mixing the score in with the sounds emanating from the screen (rushing water, heavy winds, machinery and vehicles) and also through the intermittent disconnecting and overlapping of those sounds from and with their source imagery, Tarkovsky instils the sense of everything, both on-screen and off, being intrinsically linked, of bleeding into each other but also, specifically in relation to the scenes in the Zone, of being constantly in flux. The blasted, atrophied landscape of the city and the Zone, with its industrial edifices, abandoned tanks consumed by vegetation, strewn detritus and chemically poisoned river, is fully exploited by Tarkovsky and provides a startling and unsettling environment for the characters to inhabit. That these images, shot in the late 1970s, and the terms ‘Stalker’ and ‘the Zone’ would themselves come to be associated with Chernobyl in the 1980s speaks for the film’s lasting influence on contemporary culture. Suffused with quasi- and outright religious imagery, an ambiguity allowing for multiple interpretations and exuding a uniquely realised visual aesthetic, Stalker is a towering achievement both for its greatly missed director and for the medium as a whole. Essential viewing. This review was first published for the release of Stalker as part of Artificial Eye’s Andrei Tarkovsky Collection box set in June 2011.